Although it is found among the same rolling hills of the Algarve, the Laguna Course is distinctly different from its neighbours in Vilamoura, as it has a distinct links accent throughout. As the name hints, the course is punctuated with water; in fact, the network of lakes and streams come into play on no less than 11 holes! 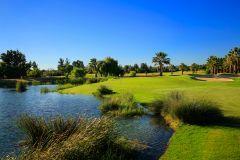 Located in the buzzing resort town of Vilamoura, the Laguna course is just minutes away from the beach, marina, hotels, and other championship courses. This incredible location makes Laguna ideal for groups heading to sunny South Portugal, and the quality of the course ensures a good will be had by all. We found 32 offers matching your search. The Laguna was designed by Joseph Lee, an esteemed American golf architect, and was opened in 1990. From the championship tee markers the course reaches 6,706 yards, and is a greatly enjoyable test of golf for every visitor. The main obstacle apart from the ever-present water is the wind, which can be a nuisance as the location is somewhat exposed, but alternatively a cooling breeze can be extremely welcome, particularly in the steamy summer months. an open space course, plenty of room, trees in the right places to keep play on time.good holes with water around. IN GENERAL THE VILAMOURA COURSES ARE WELL USED, ALL A GOOD TEST OF GOLF, WE WILL VISIT AGAIN, AM SURE. Overall pretty good, though all our group found the greens too difficult for the averag3 golfer. One thing that wasn’t made clear by the staff at the course was that the shuttle service back to our hotel finished at 6.30, which was before we’d finished playing, after a bit of heated discussion they managed to resolve it. For our group we found the course to be an enjoyable experience even though water was oe of the main obstacle. Suitable to all golfers irrespective of handicaps. Not my favourite course. Obviously from the name there is a lot of water, so unfortunately we lost a few balls. I really enjoyed this course. I was paired with a few members and this was thoroughly enjoyable. Best course out of the 3 we played. Quite difficult and very interesting. A good test of golf. Nice course, some tricky holes over water. Water water water you have to plot your way around most holes but also allows you to drive those fairways Greens were lush and a little slow but very good for time of year. Staff were officious and rude. So preoccupied with pace of play. They try to get too many players on the course. It spoilt our experience. We would think twice about returning. Think this course is tough for Lady Golfers. The name say's a lot, plenty of water to avoid , a bad shot is punished but it keeps you concentrating on distance control.